Kai USA greatly values written content in order to tell customers about its hottest products. The company sells kitchen and sport cutlery, which both make fun topics to write about. My work includes product launch posts, how-to guides, catalogs, and more. As a team, we spread this content marketing using various platforms. Consumers and vendors read about Kai in some shape or form. My content is shared on Kai's website, email blasts, and social media. Have a look at some of my best work below. 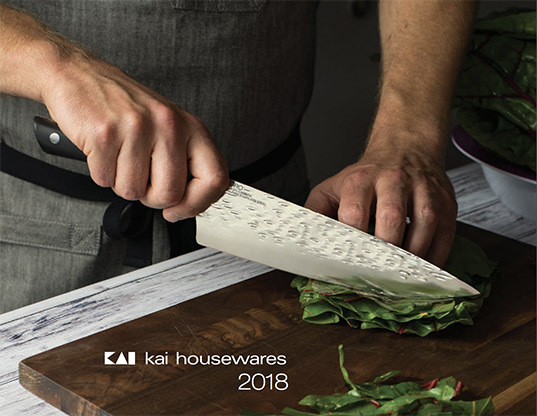 "The Kai logo is synonymous with sharpness and reliability. To do this, Kai USA works with testing laboratories to evaluate our knives’ hardness, sharpness, microstructure, and other factors. The result? Each series meets or exceeds industry standards." "Today, Kershaw still does quality control in the USA — albeit with more sophisticated methods. It doesn’t matter what country they come from. Kershaw’s U.S. team strives to ensure quality." "As you advance in your kitchen journey, you’ll eventually run into a bit of a head-scratcher. What do you do when you outgrow entry-level cutlery? Kai tackled this problem head-on, bringing you a series that’s both affordable and high-performance." "Here's the deal: if you need warranty service for a discontinued product, we may have the correct parts to repair or replace it. The warranty department is filled with overstock parts that can be used to repair these ZTs."